How did the Central District become Seattle’s historically black neighborhood? Posted on January 15, 2019 at 7:24 pm. The City of Seattle's Office of Economic Development office works to foster an economy where no matter who you are, who you love, or where you're from, you can achieve your career and business goals. We promote economic mobility and shared prosperity by providing resources to entrepreneurs and innovators, and to our current and future workers. The Central District — or, depending on whom you’re talking to, the Central Area — has seen so much change over the years. It’s hard to get a grasp on its origins, but reader Beth Anderson wanted to try. You voted for us to answer Beth’s question, so let’s dive in. But first, let’s quickly rewind to give a basic answer to the first part of her query. Before there was a Central District, or even a Seattle, all the land making up the Seattle area belonged to the Duwamish people. After white settlers arrived in the 1850s, the land was signed over to them (though the settlers never fulfilled the promises they made to the tribe). Not long after that, the first black Seattleites arrived. Who were those early black residents? Manuel Lopes, who arrived around 1852, and William Grose, who arrived with his wife, Sarah, and two kids around 1860. Both men set up their own restaurants and barbershops. William bought about 12 acres — about five blocks — of land from Henry Yesler, one of Seattle’s first settlers, and made a home near Madison Valley. He would later let other black folks build homes on his property as racist housing practices took hold and kept minority settlers from living in many other areas. More on that in a minute. William’s land, which couldn’t be restricted because it was his private property, became a spot where Seattle’s growing black community could flourish, says University of Washington professor James Gregory, who directed the school’s Seattle Civil Rights and Labor History Project. 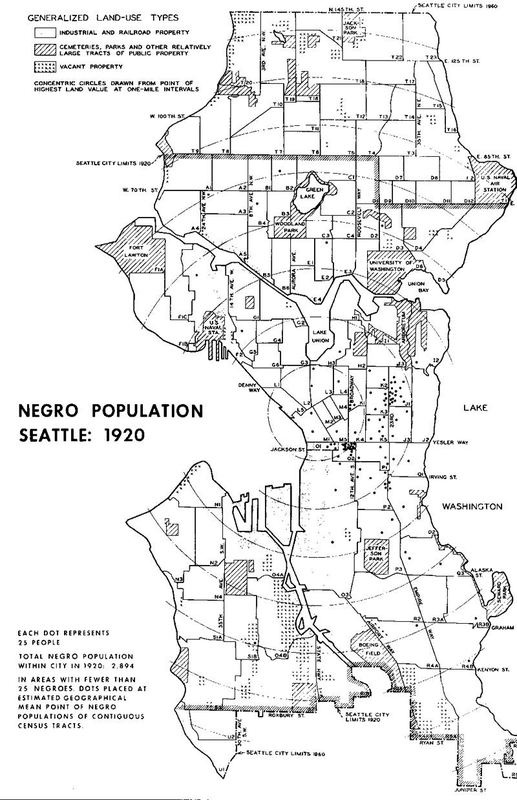 By 1920, nearly 2,900 black people lived in Seattle. They’d settled across the city by then, but a majority lived in the Central District and among the well-established Chinese and Japanese communities in Chinatown-International District. Before the decade was over, black and other minority communities would flourish in these areas. We often hear that the CD is historically black. Which other minority communities have lived there? Whether you were black or Jewish or Japanese, the Central District was a place that locals who didn’t fit into the white Christian mold could call home. The numbers aren’t super clear. Up until World War I, the CD had a thriving Jewish community, according to HistoryLink. After WWII, many Jewish CD residents moved south to Seward Park or to the Eastside. As for the area’s Chinese and Japanese communities, around 1920, they mostly lived in Chinatown and an area known as Nihonmachi, or Japantown. 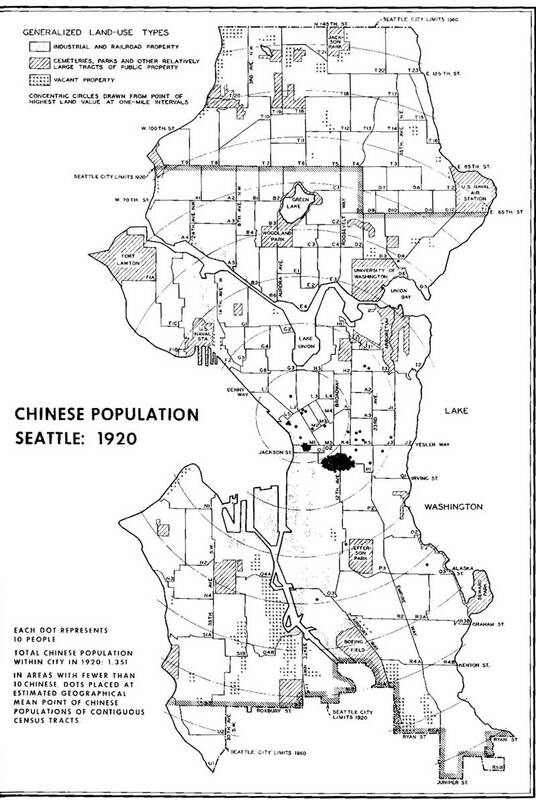 The Central District, meanwhile, was home to roughly 100 people of Chinese ancestry, around 300 Japanese-Americans, and approximately 1,000 black people, according to census maps. Jackson Street, which bridges the two neighborhoods, was home to people of all three groups and other people of Asian ancestry not distinctly counted in the census. Although Japanese internment during World War II mostly dismantled Nihonmachi, parts of the Central District and International District still reflect some of the neighborhood’s Japanese heritage. By 1970, some parts of the CD were up to 36 percent Asian and Pacific Islander. So why did these minority communities end up living in the Central District, and not some other part of the city? Because of awful, racist housing practices like racial covenants and redlining, which made it hard to buy or rent a home anywhere else in the city — and blocked many black people from building wealth through real estate. A couple quick definitions: Racial covenants kept homeowners from selling or renting their properties to blacks, Asians, and often Jewish people. Redlining was used after the Great Depression and literally involved coloring certain neighborhoods red on city maps to mark supposedly “hazardous” financial areas. It was used by banks and the real estate industry as an excuse for denying home loans or making interest rates sky-high for people who lived there. You guessed it: Those areas were the neighborhoods where many people of color, particularly black Seattleites, were already living. Because of this, the CD and the International District were essentially the only places many minorities, particularly black folks, were allowed to live. Seattle artist Inye Wokoma says he never heard the word “redlining” growing up in the CD, but he did know his grandfather was only able to buy his first house in the 1940s because it was sold directly to him by its white owners. What happened to those racist housing policies? Racial covenants were outlawed in the U.S. in 1948, but that didn’t stop property owners and realtors from discriminating. The UW civil rights project also noted that some white Seattleites would threaten non-whites and Jews looking to buy homes in their neighborhoods. So Seattle remained pretty segregated. That meant folks in the CD were over-policed and that their local schools and infrastructure didn’t get the investment and attention they needed, Inye said. But still, the CD’s black community thrived. Between 1950 and 1960, the black population in parts of the Central District grew from about 45 percent to about 84 percent black. In analyzing census data from a roughly two-mile stretch the neighborhood’s north and south ends, The Seattle Times found that, in 1970, the CD was about 73 percent black — a figure that’s dropped to less than 20 percent as of 2015. Those numbers could drop to less than 10 percent black by 2025, the newspaper reported. Despite rapid gentrification, local activists are fighting to preserve the CD — a place Inye said once felt like “one neighborhood living room” — and make sure longtime residents can afford to stay in their homes. Want to learn more about the neighborhood? Don’t miss our guide to the CD. Why can’t Seattle just build more affordable housing on the extra land it owns? Cast your vote: Which of your questions about homelessness should we answer first?